In 1993, after 25 years of dedicated service at Waitz Model Market, Juan Nino’s friend and mentor Mr. George Waitz retired leaving many of his customers without a source for their fresh produce needs. Mr. Nino recognized there was a need for a fresh produce supplier, and his 25 years of produce experience made him the candidate of choice. Nino’s Produce began with one pickup truck, and 60 dollars. Juan Nino began buying fresh produce at the terminal market, and selling it to restaurants around the area. A year later he found himself renting refrigerated space at the Produce Terminal Market and started ordering his own products directly from suppliers in California, Arizona and Idaho. Mr. Nino attributed his growth to doing business with integrity, honesty, and providing quality produce. In 1995, Mr. Nino bought two refrigerated delivery trucks to satisfy an increased demand for his fresh produce. Juan Nino was dedicated to providing fresh and quality produce. Shortly after, Mr. Nino became dissatisfied with the quality of the processed items he was shipping from out of state, so he decided to begin processing in house. This marked the beginning of a new processing operation which changed the name from Nino’s Produce to Nino’s Produce & Processing. In order for Nino’s processing operation to get off the ground it had to go through a rigorous certification process required by the city, state, and federal government. In February 2011, after having retired from a short break from the produce industry, Mr. Juan Nino returned to the industry with an expanded, new and much improved facility. Mr. Juan Nino formed his new company, Nino’s Fresh Cut Fruit and Veg., with one simple objective: To take his products back to their deserved place in the hearts and minds of its customers. 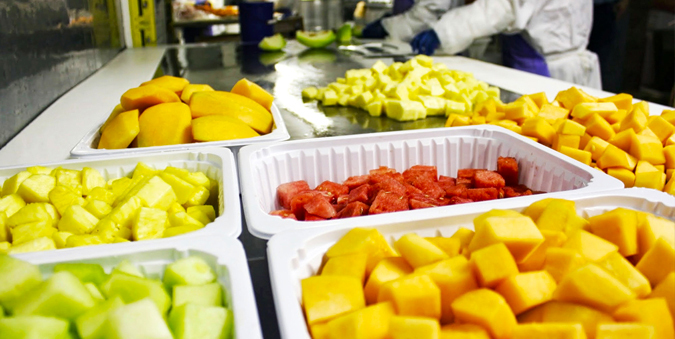 Discover what makes Nino's Fresh Cut Fruit & Vegetables so delicious.